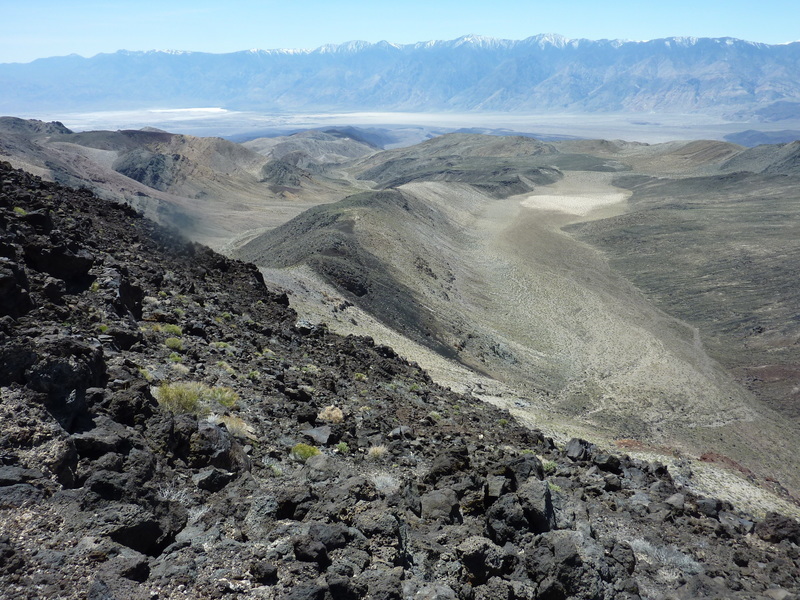 Saline Peak is the highpoint of the Saline Range, separating Saline Valley from Eureka Valley in Western Death Valley NP. Tom and I, along with Karl, had made an attempt to reach it two years earlier from Saline Valley to the south, only to find the road too rough for the Honda Element we were driving in. Earlier this year, Brian and I attempted to reach it from Eureka Valley and Steele Pass but found the narrow Dedeckera Canyon too much for his large 4x4 truck. Brian came back on his own with his dog Rex and a mountain bike a month later and successfully reached the top. Still, he seemed almost as eager as Tom and I to join us for my third attempt in which we planned to tag Black Top BM as well, a lower summit in the area that had eluded him that day. Much of the day would be spent driving, almost 5hrs all told, as the summit is hardly convenient from where we were camped at the junction of Saline Valley and Hunter Mtn Rds far to the south. We spent almost two hours at the beginning of the day driving to Saline Hot Springs, where despite it being 4-20 today, we had little interest in spending much time at this hippie time-warp. The place seems to be populated by a mostly older crowd from those times, predominately male, whose bodies were particularly unappealing. One couldn't help but think clothes had been invented for just this reason. More driving took us northeast up the wash separating the Saline and Last Chance Ranges, another ten miles of driving where the road was in the roughest condition. This was the section that had turned us back previously in the Element, but the Jeep had no such troubles and managed it beautifully. It wasn't until almost 9:30a that we finally reached our starting point along the road east of the two summits. Our ascent route up a wash heading northwest proved a good one. Though somewhat rocky in nature, the footing was decent and the brush minimal. There were some flowers to brighten the desert scene, but not as much as one might expect from the so-called, "Super Bloom" which we guessed must be highly variable in location. After following the main branch of the wash for about 2.5mi, we climbed onto an adjacent ridgeline and followed it in a curving arc for the last mile to the top of Saline Peak. At over 7,000ft of elevation and nearly 1,800ft of prominence, Saline Peak dominates the range atop which it lies, though the views are not as spectacular as the stats would suggest. The top is large and rounded, partially blocking views down to the wash we'd ascended as well as Eureka and Saline Valleys, to the north and south, respectively. The Inyos rise much higher to the west as does Dry Mtn in the Last Chance Range to the east. Still, it is a very pleasant spot to take in some fine desert scenery and one feels about as remote as one can get in the California Desert. A register left by Wes Shelberg in 1977 has more than 50 pages of entries, attesting to its popularity. Many of the early entries through the 1990s were various DPS groups though the summit never made it onto their peak list. Not surprisingly, Brian's previous entry was the last before our arrival. We hung about for 20-30min eating lunch and taking a break before packing up and making our way to Black Top BM, 1.7mi to the southwest. This was a fairly pleasant stroll, dropping about 900ft to a wide saddle before climbing 400ft back up to our second summit. An old survey tower still stood at the summit, held erect by guy-wires anchored to rock cairns. The benchmark was located under the large summit cairn we surmised, though none of us cared to exert the extra energy to unearth it. A couple of reference marks pointed to its location. Wes Shelberg had left a register here as well, though nearly two years later than the one on Saline Peak. As expected, this summit was far less popular with less than ten pages of entries over the past 40yrs. Our stay atop the summit was a much abbreviated version of our Saline rest stop and we were soon on our way back down. We intended to take a completely different route for the descent, following a ridgeline to the south of our ascent route. The plan was disrupted when we were about a quarter of the way down and spotted an interesting looking white-colored canyon to our left. As we continued our descent I angled over towards an overlook that would allow us to see partially down into the chalky gorge. "What do you guys think?" I asked, already knowing which way I wanted to go. Brian's eyes lit up with excitement as he responded, "Time for some explorin'!" Whether Tom was equally interested was almost moot at this point, but he made no objections as we all descended into the canyon. The white rock, whatever it was made of, had pretty good traction and was fairly solid. It started off well enough after the intial steep entry, but soon the walls began to close in from two sides. We got past one steep section where we ended up taking three different routes (Tom and I down steep, somewhat loose slopes, Brian choosing a dry waterfall), but the problems did not relent. We came to another dry waterfall that looked like it might be difficult to reascend, if necessary. Rather than all three of us dropping into the potential trap, the others let me go down first and scout out the route ahead. After disappearing around a bend, I began to think it would get easier, but the twisty little passage led to another dry waterfall more formidable than the last, one I surely couldn't get back up and might not be able to get down safely, either. I reluctantly went back to the others to give them the bad news. I tossed my pack up to Tom and then squirmed and wriggled my way back up the difficultly. Rejoining the others, the safest plan at this point seemed to be to abandon the canyon. Awesome register documentation -- as always -- fun to reminisce -- Thanks! I visited Black Top BM on June 5, 2005. According to my notes, as of that date only about 5 parties had signed that register. :) I also got a pic of the BM itself. I'll post a scan of it (yes I was still using 35mm in 2005) over on the LOJ Black Top BM page.